A PORTABLE abattoir concept which takes the processing facility to the cattle, rather than the reverse, won top honours when the 2017 SproutX cohort took to the stage to deliver their pitches for the first time. Eleven ag-tech entrepreneurs accepted into SproutX’s first accelerator program pitched their ideas at an event in Melbourne over the weekend. SproutX is Australia’s first agtech accelerator and is a partnership between the National Farmers Federation, financial services provider Findex, and national agency business, RuralCo. A highlight of the start-ups’ first week in the program was a “Shark Tank” style pitch competition, held in Melbourne on the weekend, attended by 300 agtech enthusiasts. After all eleven pitches, the judging panel and crowd were asked to cast their vote – with both the people’s choice and judges’ award going to Farmgate MSU’s mobile abattoir concept. Farmgate MSU is a team including a farmer, vet, chef and educator looking to ‘disrupt’ the red meat supply chain by slaughtering cattle on-farm in a mobile abattoir. In its pitch, it claimed that travelling 150km to a conventional processing facility was a ‘real problem’, because it added additional cost to the farmer’s business, and decreases the quality of the meat produced. “We’re going to pivot the supply chain on its head,” the group’s presenter said. “We eliminate live animal transport, while increasing animal welfare, and producing the highest quality meat that has not gone through any stress. We’re able to move the farmer up the value-chain, while reducing the cost to the farmer,” he said. Under the model, the unit pictured in this image, and attached video, would go to each farm, operating for one to two days, before moving on. From there, carcases would be moved to refrigerated trucks, and relocated to a centralised, conventional boning room. “We have farmers screaming out for this already, and consumers who want to see it from an improved quality and animal ethics perspective,” the presenter said. “The Australian domestic market alone offers an outstanding opportunity to bring some disruption to the current supply chain,” the presenter said. 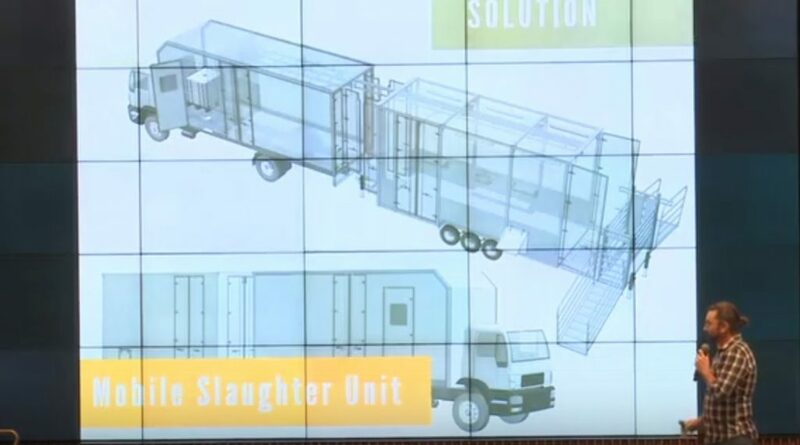 “There is no competition: we will be the first truly mobile slaughtering unit. We expect some competition from conventional abattoirs, but our flexibility, nimbleness and efficiency is going to put us in a great position to take a part of that supply chain,” he said. There is nothing particularly original about portable killfloor concepts, however. Mobile butcheries have done farm kills for livestock owners’ personal use for decades. Larger truck and trailer-mounted mobile processing facilities including killfloor and coldrooms, were in use in the Northern Territory and other remote areas of Northern Australia during the 1970s and 80s, processing beef cattle, buffalo, brumbies and donkeys. The concepts faced numerous difficulties, however – just one of which was access to reliable food processing-grade fresh water. Several tried to gain USDA export licenses, but failed, limiting trade to local markets. Fixed costs and low throughput made the mobile processing units highly inefficient to operate, and none lasted more than a year or two. The SproutX event pitch by Farmgate MSU made no mention of issues like how electrical stimulation would be applied to the carcase in such an environment , or how environmental management issues such as the disposal of eviscera, blood, paunch material, heads and waste water would take place. Agriledger, uses a blockchain system to create a marketplace for small farmers in developing countries to buy, sell, and trade produce, creating a digital ledger for a cooperative farming model. IoTAg Pty Ltd has developed a smart cattle ear tag enabling farmers to track cattle movement and monitor for key breeding-related events, as well as alert them to illnesses and births. OutofBox Solutions are using AI and machine vision to tackle identification and control of feral animals. thingc is developing a precision farming application using big data to help farmers grow more efficiently. All ideas showcased at these first pitches will now be further developed through the accelerator program, SproutX said. Each member of the 11-string cohort will receive about $40,000 from SproutX in exchange for an 8pc equity stake. The six-month accelerator program focuses on financial modelling, marketing, legal and intellectual property issues distribution partnerships to help start-ups solve their biggest issue; getting their products into the hands of customers. Start-ups will either be based at the accelerator’s co-working space in Melbourne or will be flown-in every five weeks for a one-week intensive work session. National Farmers Federation president and SproutX board member Fiona Simson said the unveiling of the first cohort of projects was a milestone for the company and for Australian agtech in general. Ms Simson said the challenge was turning sound ideas into reality. Start-ups also gain access to potential follow-on angel and later-stage venture capital funding of up to $1 million through the SproutX Venture Capital Fund. The fund will provide follow-on funding for chosen start-ups alongside a network of external investors, expediting funding rounds and reducing pressure on start-up founders to spend time away from their core focus of growing their business. What a great idea, how can I get involved? Where is the validation that the “refrigerated trucks” will chill the carcass effectively and meet food safety requirements that processors must comply with now ? The so called “disruption to industry” will undo years of research and GMP put in place across the industry for very good reasons, food safety and to protect the Brand of Australian Beef and Lamb! I cant wait to see what the supporters of this say when there is a massive food poisoning outbreak or worse still, what our overseas customers say. I can see the CNN headline now! “Australian Meat Makes Hundreds of people gravely ill! you can bet the house on it it not saying ” a little mobile abattoir in in the bush causes food poisoning”. Where is the “technology” in the winning idea? It could hardly be more basic. thinking that they “know better” than seasoned Processors further down the supply chain.